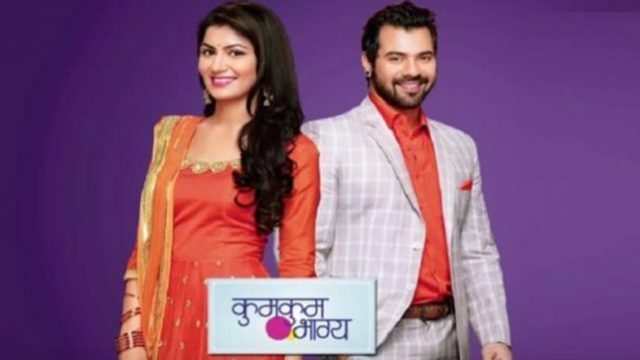 In this episode all about Tanu insults Pragya. Tanu never likes Pragya, she always thinks to keep down in front of others. The episode of Kumkum Bhagya starts with Pragya looking at Abhi. He also looks on her face. Tanu asks Disha to show what she was selected for herself. Disha shows chain that she has selected for bought. Tanu was not be satisfied by selecting this light chain by Disha. She thinks that Disha will buy some heavy jewellery for herself. Tanu asks her to choose something heavy but Disha told that she does not wear heavy jewellery. Tanu saw the indicator of marriage That is Mangalsutra is in Pragya’s neck after Abhi told her about all incident that happens by mistake and hears Abhi calling it as God’s wish. Abhi said to Tanu that there is the wish of god behind this incident. Tanu says it is just an accident and not God’s wish else Pragya would not have remarried. Tanu gets anger by listening to this by Abhi. Pragya tries to take off the Mangalsutra that is dropped by Abhi and Tanu asks him to see it. Tanu was so clever she shows this to Abhi because she wants to drop the image of Pragya in the eyes of Abhi. Tanu goes to Pragya to take back the indicator of marriage, Mangalsutra and she snickers her. Abhi fell little sad for this coincidence. So Abhi goes to Pragya and told that it was unintentionally done. After Abhi went, Tanu taunts her further and demonstrate about their marriage. To listen this Pragya get sad. She is shocked and there is full of tears in her eyes. Tanu says Abhi had bought the Mangalsutra for her. Tanu told all this to feel bad for Pragya. King thinks that Pragya will be happy to Know about the deal that he signed. But he doesn’t know about the coincidence that is faced by Pragya. He thinks that he contemplates Pragya as his family, but she thinks otherwise. He suggested purchasing a beautiful necklace for her. He thinks that Pragya got happy to saw this. Tanu is firm on her decision of hurting Pragya and continue to taunt her. She calls Pragya names and asks her to stay away from her husband Abhi. To listen this Pragya fell guilty. She’s accused Pragya of trying to steal Abhi from her. Tanu further told that probably Pragya is not happy with her husband and that’s why she has come to trap Abhi. But there is no intention of Pragya about this. Pragya tells her that a king is a respectable man but Tanu asks her to be with him and give return her Mangalsutra. To listen this Pragya is traumatized.